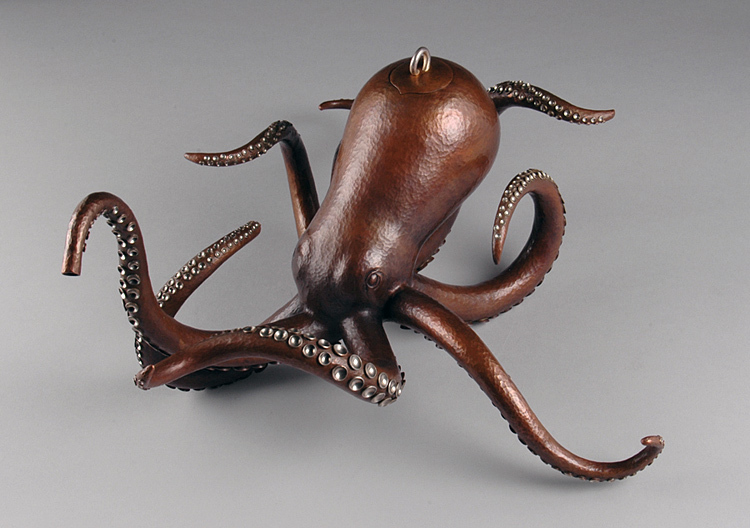 This octopus-shaped vessel by Miel-Margarita Paredes is a fully functional teapot with a removable lid over the hollow space in the head that forms the body of the teapot, and a curved tentacle forms the spout. 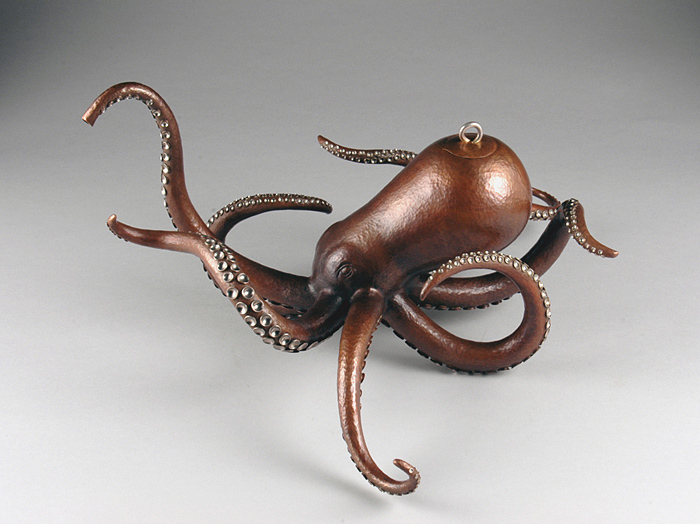 Paredes is a metalsmith and artist known for creating sculptures based on naturalistic animal forms. Some themes in her work include fashion accessories for animals, mechanical toys that imitate the motion of rabbits and birds, decorative objects incorporating animal faces and mouths, and metal helmets. In addition to this teapot, Paredes has also made functional tea infusers in the shapes of cicadas and moths, as well as a wearable, octopus-shaped helmet titled The Dullest Pencil. Many of Paredes’s sculptures explore ideas about how humans interact with other animals, including anthropomorphizing the needs and desires of domesticated animals (as Paredes did in her Accessories series) and the symbolism of displaying animal bodies as hunting trophies or decorative works (as Paredes did in the Trophies and Gnaw series). It is not clear if Paredes intended for Octopus Teapot to have a specific symbolic meaning, but it is interesting to note that this teapot—a tool for human use—is in the form of a non-human animal which is known to use tools as well, and that it dispenses drinkable liquid from a creature that is sometimes dangerously poisonous, but also is consumed as food. Additional images of the process of creating this teapot can be found on Paredes’ website. The Kamm Teapot Foundation also has three other sculptures by Paredes in its collection, including a non-pourable teapot sculpture titled Inquire After. Corwin, Nancy Megan. Chasing and Repoussé. A&C Black, 2009. Franz, Janie. 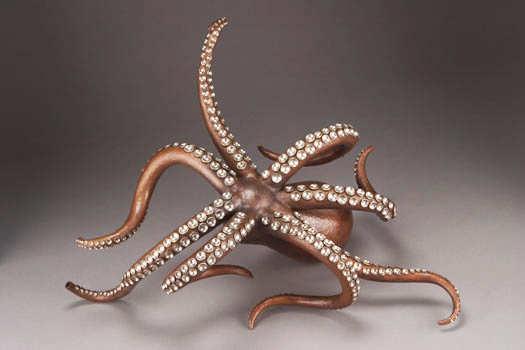 “Miel-Margarita Paredes Imaginatively Reinterprets Our World.” Copper in the Arts, Apr 2009. Keim, Brandon. “Tool Use Found in Octopuses.” Wired, 14 Dec 2009. Society of North American Goldsmiths. SNAG Conference Program, 40th Annual Conference, Seattle, Washington, May 26–29, 2011, p. 23.